Matt Howe, 2009 WIU School of Ag alum, speaking at Yale University about modern American farming in one of the weekly sessions of Yale's 11-week Agrarian Studies Program. 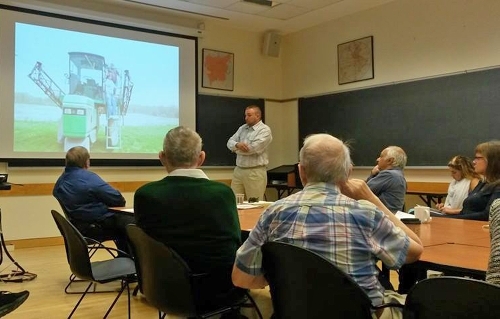 MACOMB, IL - - Last September, Western Illinois University alumnus Matt Howe and his father, David—both farmers near Lewistown (IL)—wound up in what could be considered an unlikely forum for Midwestern agriculture practitioners who deal with crops and cows in their everyday lives. According to a January 15 Associated Press article by Ken Harris, the two west central Illinois farmers "found themselves speaking in front of a crowd of East Coast intellectuals" at a Yale University colloquium. The article featuring the younger Howe (who graduated with his bachelor's degree from the WIU School of Agriculture in 2009), and his father, covers why the Howes were asked to share their expertise at the academic colloquium held in New Haven (CT). According to the article by Harris, the men were invited to present about modern American farming in one of the weekly sessions of Yale's 11-week Agrarian Studies Program. Howe said the family runs a farm near Lewistown—on which they grow corn and soybeans and raise cattle—that has been in the family for 131 years. According the article, Howe learned he had been selected to speak more than a year ago. "Over the course of a year, [Matt] carefully documented his work as a farmer, from planting in the spring to harvest in the fall and beyond. He wrote an accompanying paper and submitted it to [Yale] to distribute to potential colloquium attendees," Harris stated. "For Howe, it was an opportunity to use his experience to educate the future lawmakers and lobbyists, the ones who will be working on the farm bills that actually affect the livelihoods of people like Howe and his father. It was an opportunity to lobby on behalf of Midwest farmers." In Harris' piece, the younger Howe shared his initial feelings about his experience presenting at the historic Ivy League institution. "It was a little bit intimidating at first because the people that were in attendance there—there were professors from universities around the nation and even the world," [he] said. "There's a real concern with them about where their food is coming from today and who is growing their food." To read Harris' article about the Howes, "Exchange: Illinois Farmers Share Expertise," visit http://bit.ly/WIUAlumYaleAgrarian.